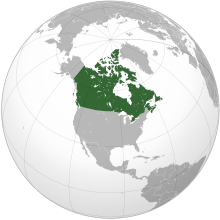 ଜାତୀୟ ସଙ୍ଗୀତ: "God Save the Queen"
↑ Department of Canadian Heritage. "Royal anthem 'God Save The Queen'". Queen's Printer. Retrieved May 23, 2011. ↑ Kallmann, Helmut. Marsh, James Harley, ed. "National and royal anthems". Encyclopedia of Music in Canada. Historica-Dominion. Retrieved May 23, 2011. ↑ Official Languages Act (PDF). Government of the Northwest Territories. 2004. p. 4. ↑ "2011 Census: Population and dwelling counts". Statistics Canada. February 8, 2012. Retrieved February 8, 2012. ↑ ୭.୦ ୭.୧ ୭.୨ "Canada". International Monetary Fund. Retrieved April 18, 2012. ↑ "Distribution of family income – Gini index". World Factbook. CIA. Retrieved September 1, 2009. ↑ "Human Development Report 2011" (PDF). United Nations. Retrieved November 2, 2011.